Family Holidays are where the fondest memories are made. They're wonderful times where the whole clan can relax and break away from the worries of everyday life. Whether you're seeking action and adventure, or a week or two of sand, sea and splash, we understand you need to make sure everyone is catered for. That's why we're on hand to help. With a wide range of villas for up to 20 people, as well as 14 dazzling destinations to choose from – all that's missing is you! Being able to share fun memories and special times with your family and friends is a magical experience. That's why finding the perfect place to stay is paramount. Bountiful bedrooms and bundles of bathrooms means there's plenty of space for stretching out and relaxing without stepping on each other's toes. Say hello to 'more the merrier' and wave goodbye to past holiday hassle. 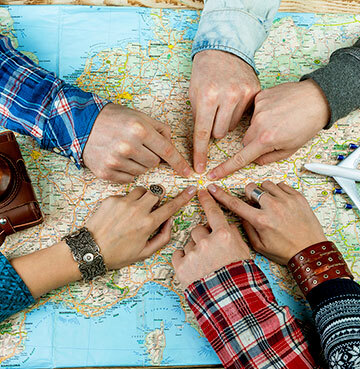 Picking a holiday destination that everyone loves is easier than you think! Pool your resources and write up a list of all your favourite things to do and holiday 'must-haves'. It gets the whole family involved and starts the quality time together early… If you need a little extra help, get inspired for your dream getaway with our holiday ideas. Drawing up an itinerary is always great fun and helps with finding the destination that fits your family best. Don't forget to schedule in that most important of activities; relaxation! Florida is a destination where there truly is something for everyone! Toddlers, pensioners and all the in-betweeners can release their inner child and visit the Magic Kingdom at Walt Disney World resort. For bigger kids, take a trip to the spellbinding wizarding world of Harry Potter™ at Universal Orlando™ and conjure memories that will last forever. Of course, t's not all theme parks and movie characters in the Sunshine State! 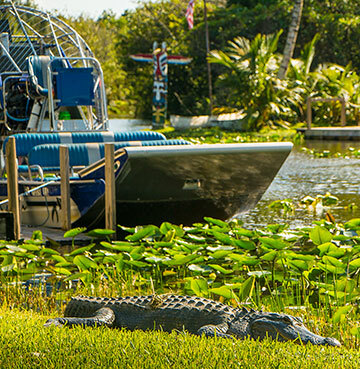 Florida is home to amazing wildlife and you can see all kinds of creatures including alligators, crocodiles, turtles, snakes, lizards and even manatees! Why not make a day of it and take an exhilarating airboat ride through the Everglades National Park where you'll feel like you're gliding on water. Don't fancy getting your feet wet? Clamber along the treetops and traverse the thrilling Tree Trek Experience in Kissimmee. Daytona Beach is another unmissable holiday hotspot! 23 miles of sweeping sand and a promenade filled to the brim with amusements and attractions. From theme parks to racing tracks and quiet beaches to bustling promenades – you're sure to find plenty of crowd pleasers along the way. For a bit of peace and quiet head to the southern end of Daytona and stroll through Ponce Inlet. This area is removed from the crowds and lets you enjoy a few quiet hours sunbathing. When you've had enough of the towel, walk along the Main Street Pier. The longest pier on the east coast gives you the perfect backdrop for that all important family photo. If you reach the end of Main Street refuel yourself with the famous peel-'n-eat shrimp before heading back. 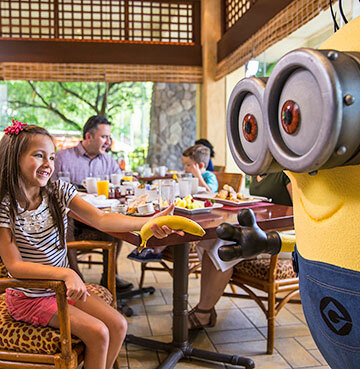 Orlando doesn't just come alive during the day and the nightlife here is designed for all ages! Spectacular shows steal the entertainment spotlight. For daredevil delights there's Cirque du Soleil's La Nouba, where you can see the finest acrobats in the world perform death defying stunts. For more relaxed theatrics, there's the sensational Blue Man Group who will astound your senses with vibrancy and colour. With so many family members on hand to babysit, busy parents might even get a night off to let loose! Head towards Wall Street Plaza and Pointe Orlando for a spot of bar-hopping! These lively hubs are overflowing with restaurants, pubs, clubs and bars to help wind down after a long day. Finding the balance between adult's and children's favourite things to do can be a tricky one – but you can never go wrong with a beach day! Famed for its beautiful seas and pristine golden beaches, there's even more to the region than meets the eye. Exploring the coastline you'll find plenty of exciting areas to explore from caves and crags to smugglers coves. The calm waters also help for some family splashing and swimming, with plenty of watersports and snorkelling for the more adventurous members of your brood. A family excursion is always a great idea! Blissful boat trips will bring you up close and personal to the vast array of sea life that calls these waters home. If you're lucky you might spot sea turtles, whales, storm petrels, shearwaters and gannets. Of course, the stars of the show are the playful porpoise! From bottlenose to the harbour dolphin, there's plenty of species to be spotted off these shores. With plenty of tours available you can be accompanied by marine biologists and discover more about these fantastic creatures, their lives, habitats and more. If heading out to sea makes you feel a little queasy, visit Zoo Marine and experience the variety of sea life on dry land. This water park is also a sanctuary and acts as one of the Algarve's biggest attractions. For more thrill-seeking head for the wet and wild waterparks – all three of them! Each has something to exhilarate you, from Aqualand's Kamikaze which stands at a colossal 98m tall, to Aqua Show's 740m rollercoaster which drops in and out of the water for a high-speed thrill. 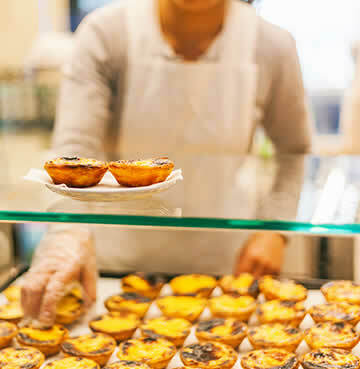 In the evening there is no shortage of dining options, with many restaurants offering both British classics and authentic rustic dishes of the region. Your kids won't have a shock to the system with fish fingers and chips while you can be bolder with your menu choices. Tantalise your taste buds with cataplana – a seafood dish famous to the region and typically made with clams and prawns, seasoned with local chorizo and spices. When you think of Mallorca you might think of beaches and pools, but this doesn't begin to scratch the surface of things to see and do on the island! If you have kids full of energy to burn then this beautiful Balearic is a fantastic choice for you. There's plenty of energy-sapping activities, from surfing to sailing, cycling to kayaking – chances of a good night's sleep are high. There is only one mode of transport that allows you to truly explore the island to the fullest. Taking the cycle path makes for a great family excursion. 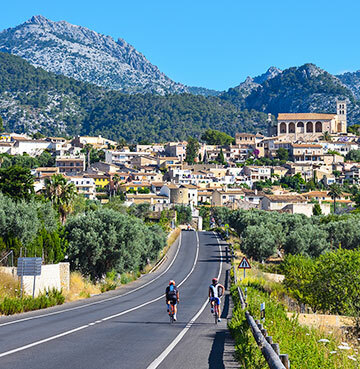 Winding through the mountainous terrain of the Tramuntana range will tyre you out, but the views and experience are something you will remember forever. If mountains sound too tough there are coastal paths for more leisurely rides like the picturesque Sóller Valley. Days at the beach are the classic holiday mainstay for good reason, it's the best place to truly unwind. Mallorca's turquoise waters are picture postcard worthy and why would you not want to relax there? Beaches here tick all those family boxes! You'll find shallow waters that are crystal clear, gently sloping sand that's soft underfoot and pine-flanked beaches that offer a little shade. Cala Mondrago and Playa de Muro are great examples of these, adding Blue Flag status and activities like snorkelling, jet skiing and boat trips. A little more deserted are the likes of Cala Agulla and Cala Mesquida, although you'll find lively and tranquil beaches scattered all across Mallorca. What's better than a day filled with paddling, sandcastles and the sound of family laughter echoing around you? And who knows, you might even get a few quiet minutes to sunbathe. For the adventurous water babies among you hiring out a paddleboard will let you explore the untouched caves and coastline, finding your own private piece of Mallorca. Besides it is always fun when someone falls in! If you're more interested in being under the water than paddling on top, there are plenty of snorkelling outlets where you can see the vibrancy of marine life along the azure coast. Hungry yet? Mallorca has been a mainstay for British tourists so you won't have to travel far to find family favourite foods, making meal times a piece of cake (literally if you want)! 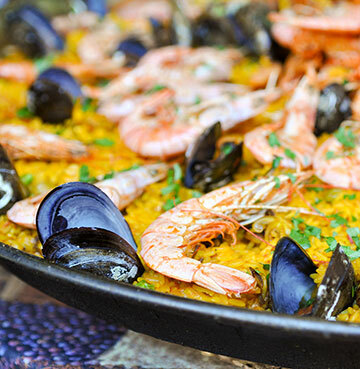 If you want to try something new, the islands Spanish heritage means you can enjoy authentic tapas and traditional meals that will make you feel like a local. The kids entertainment can be a big factor in finding the perfect home from home. Do your little ones love making friends and trying new things? They'll flourish at a Holiday Resort's kids club. 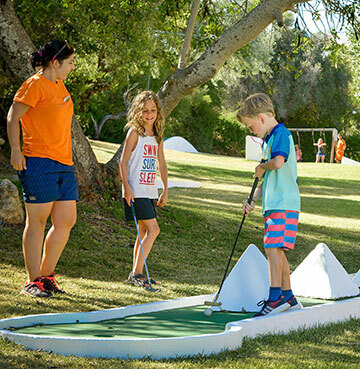 Your children will have an amazing time enjoying a different daily activity and working together in team challenges. Communal pools are also perfect for social splashing! With wave machines, climbing frames and waterparks, it's unlikely your children will get bored in a Holiday Resort. You'll find plenty of villa facilities geared towards family fun, from table tennis tables to full-sized private courts. Take a look at our guide to child friendly villas below. The challenge will be picking your favourite! As much as you may want to make your kids happy naturally you want some time for yourselves. That's why you should seek out something to do when the kids are asleep! Why not enjoy balmy evenings under a beautiful starry sky on your private terrace, or a moonlit stroll along the shoreline? 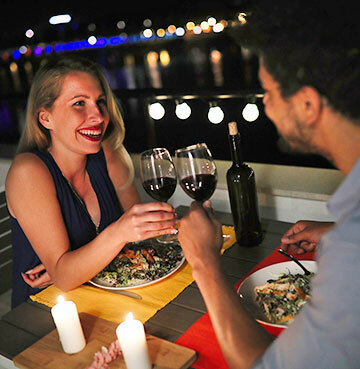 You can always venture out and take in the local nightlife from a quiet hideaway to enjoy a delicious meal in peace to a bar where you can get to know the locals. There is always something to do when you carve out a little alone time!